Do you ever start designing or making something and end up with something completely different to what you set out to make? 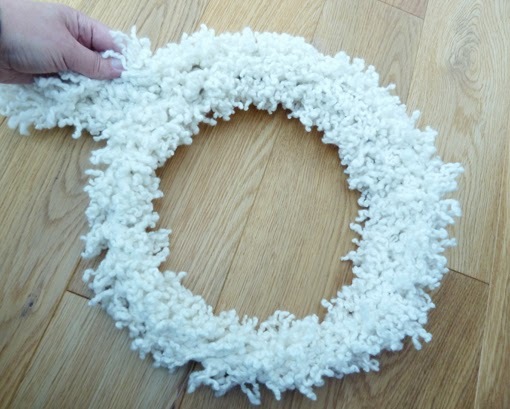 This blog post was going to be how I knitted a fur trim to decorate a Christmas jumper for Jumper Day, but somehow it evolved into a post on how to knit a reclaimed Christmas garland or wreath. It was just one of those rare, serendipitous occasions where something just seems to design itself. I'd been set the task of decorating a Christmas jumper for my daughter to wear to school to raise money for Save the Children. I'd found a red poncho that she was growing out of and I thought it might be nice to trim the bottom with some knitted fur in a sort of "Little Miss Christmas" kind of way. I knew I was going to need quite a bit of yarn, but I didn't want to spend anything on it, so I decided to pull back an old woollen cardigan that my daughter had grown out of. It's a lovely soft merino yarn and so it shouldn't be too itchy for her to wear all day. It still has that lovely crinkle of a pulled back sweater. 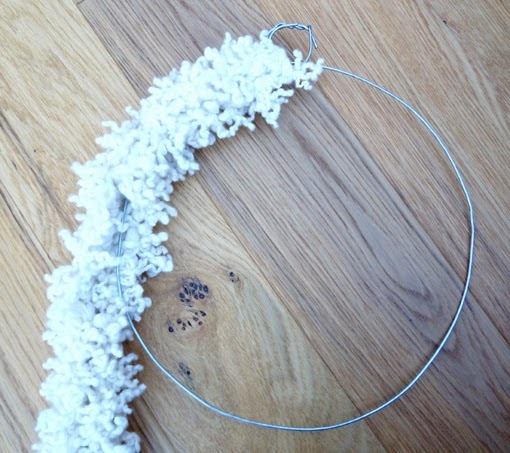 I wanted to knit it quickly and so I used 4 strands of double knit yarn together, knitted on 9mm needles. It's knitted over just 4 stitches with 1 row of knitted loop stitches and 1 row of purl stitches. I could have done the reverse side in knit stitch too but I wanted it to curl around on itself. I had a look on YouTube to see if anyone else does a loop stitch like mine, but I couldn't find one anywhere, so I made a little video of my own. You won't hear my voice on there, but it's pretty simple to see what's going on. 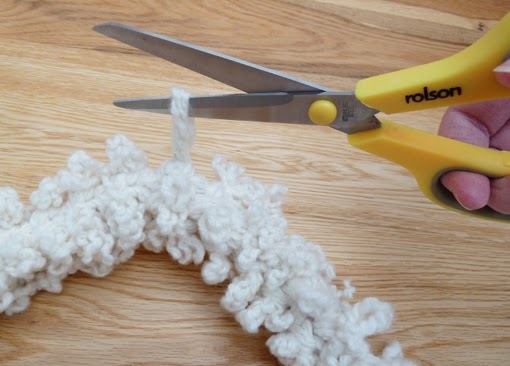 I've filmed just the knitted loop side as I'm sure you know what a purl stitch looks like. 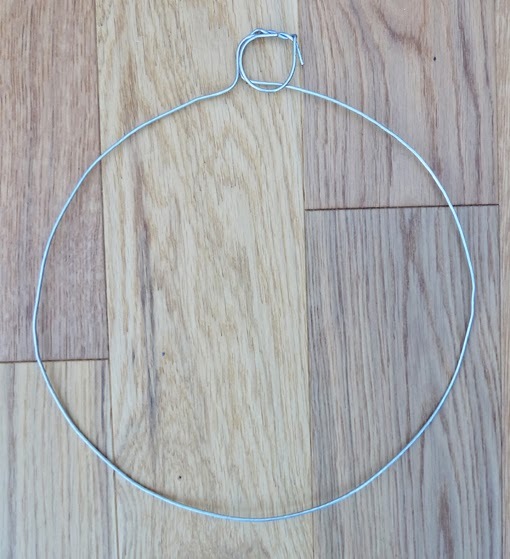 I believe that this loop stitch is more secure than the other video tutorials I came across and so will stand up to cutting better. If you can follow it, here's a little animated gif I made just for fun! 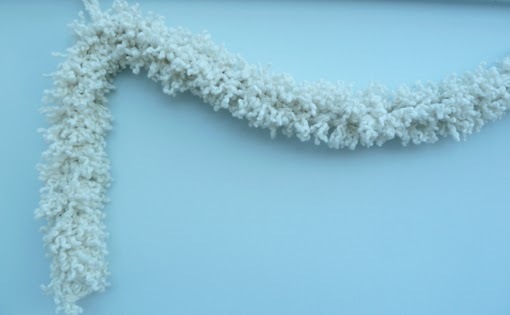 It was at this point, when it was almost finished, that I realised that my little woolly garland would also make a perfect natural Christmas decoration, maybe just to hang up, or to turn into a wreath. What do you think? With the loops still there it reminds me of a woolly string of yarny popcorn! Anyway, back to the knitted fur... I tugged at every loop to tighten them all up and went ahead and chopped through the lot. ... but the crinkle in the yarn is much more visible now and just adds to the volume. You'd think I'd planned it. 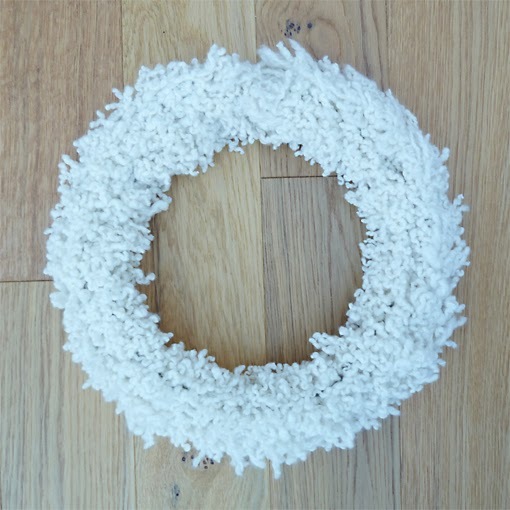 I wanted to see how my knitted garland would work as a wreath, so I found an old wire coat hanger and formed the base into a circle by hand. 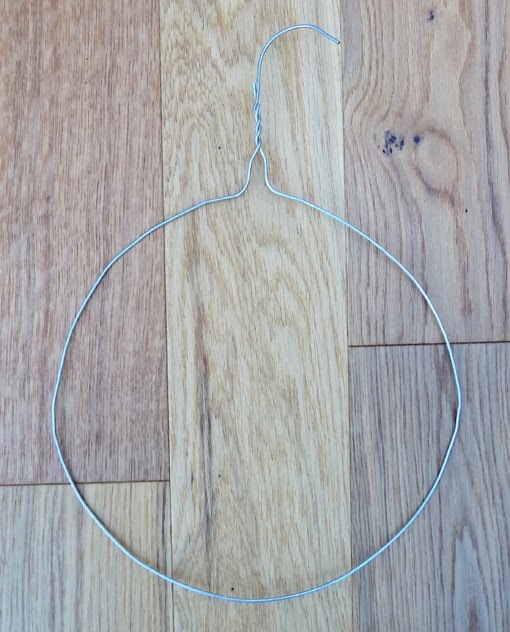 Then I curved the hook around into a circle with pliers. Now to start wrapping. I was glad that I'd worked my fur on a stocking stitch base as I was able to catch the end of the knitting on the hook and then insert the wire inside the natural curve of the stocking stitch - The natural inclination of the stitch to curl was very helpful as there was no need to attach the garland to the wreath as I formed it around the wire hanger. 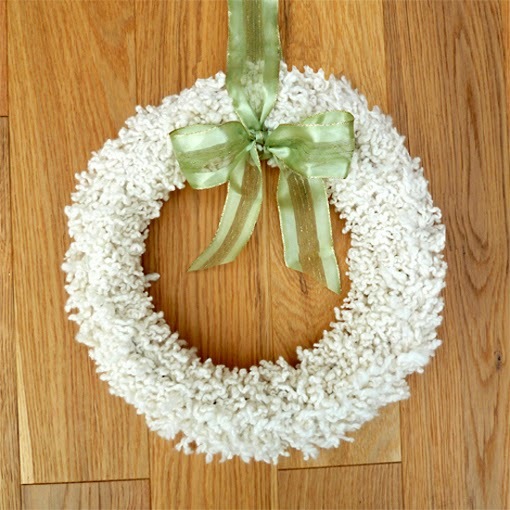 ... Or a little ribbon bow makes it just a little more special. What do you think? I'm really pleased with my happy little accident! I'm very new to knitting. 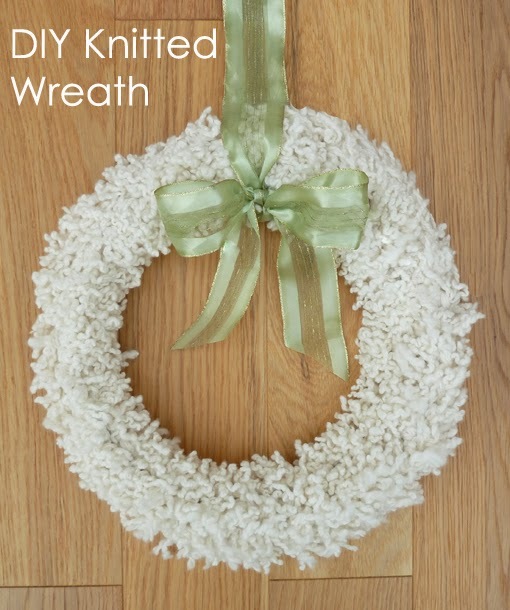 Will it still work if I use yarn fresh from the skein instead of some that's been repurposed? I suppose not. :( But I do love the happy accident! 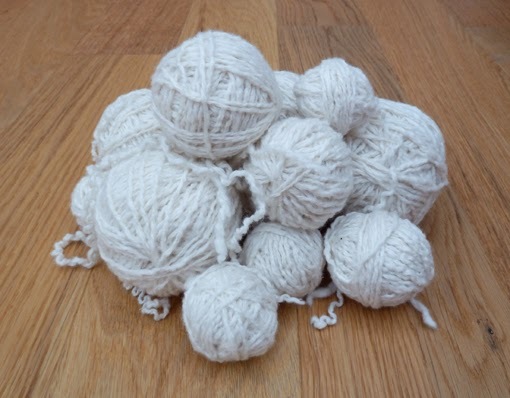 I’m sure it would work, you just wouldn’t get the same level of fullness as the yarn strands would be neater. Maybe you could use more strands than I did. Also, steaming knitted fur often fluffs it up.